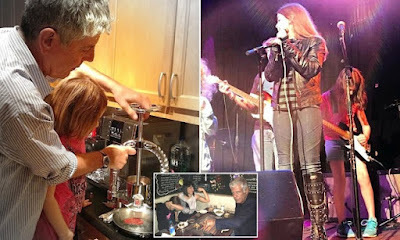 Anthony Bourdain has left the majority of his $1.2million estate to his 11-year-old daughter Ariane. A copy of the late celebrity chef's will was filed in Manhattan on Thursday, less than a month after he committed suicide in a hotel room in France. Bourdain's property includes $425,000 in cash and savings, $35,000 in brokerage accounts, $250,000 in personal property, and $500,000 in 'intangible property including royalties and residuals', according to court records obtained by the NY Daily News. The documents also indicate that Bourdain has a mortgage worth $1.1million, but the corresponding property is not specified. The total value of the estate came as a surprise to some as previous reports estimated the Parts Unknown star's net worth was around $16million. The executor of the estate is Bourdain's estranged wife, Ottavia Busia, who also handled his funeral arrangements and the process of returning his body to the US. The couple divorced in 2016 after nine years of marriage but remained close in part thanks to their daughter Ariane, who was born the year they were married in 2007. The 61-year-old had hanged himself in a hotel room on June 8 while he was in Kayserberg, France, filming an episode of Parts Unknown.